I saw this gorgeous ring on Etsy and I had to share. 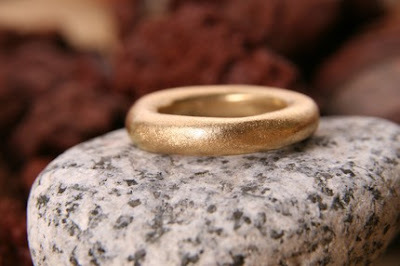 Gold bands are usually so traditional and simple. The way in which this particular band has been crafted gives it a little sparkle without needing to add diamonds or design. The organic shape of it gives it a little unique appeal as well. Since white gold/platinum is the norm, I thought it was fun to see a yellow gold band shirking the trends. I have been really into organic gold pieces as of late, and this is just stunning! Thanks for posting. Romantic and enchanting, these lovely golds add the perfect finishing touch to your wedding day ensemble,and definitely dazzling your guests and your groom. 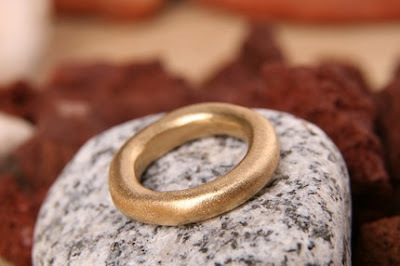 Love the simple handcrafted look of the gold ring... looking for a rose gold ring myself... one like that would be perfect!